Product #16409 | SKU MNU101 | 0.0 (no ratings yet) Thanks for your rating! 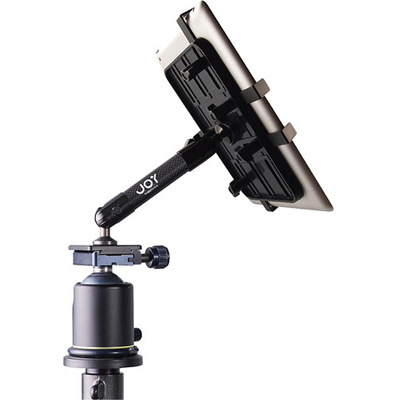 Use The Joy Factory's Unite Tripod/Mic Stand Mount to mount a 7-12" tablet to a standard tripod or microphone stand. This allows you to use the tablet as a display, steady video camera, portable sheet music library and more. Once installed, the mount holds your tablet at an ideal angle for convenience. The 6.5" arm is made from lightweight yet durable carbon fibre. The included holder for your tablet is able to swivel a full 360 degrees, so you can view the tablet in either portrait or landscape mode without taking it out of the mount. The arms can be adjusted into infinite configurations for multiple angles. Built-in knobs on the back of the mount tighten to keep your tablet in place.